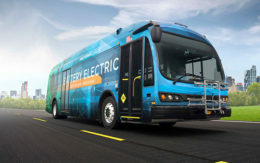 A $2 billion lawsuit filed by fuel-cell semi-tractor developer Nikola Motor Co. against Tesla Inc. for design infringement over their heavy-duty trucks could be a hard case to win, legal and automotive experts told Trucks.com. While both trucks are similar, patent law doesn’t protect a design until the patent is actually issued, said Oregon-based patent attorney Jeff Woller, a former federal patent examiner. Nikola showed a rendering of its truck cab in May 2016 and filed for six design patents in December, 2015. Both events occurred long before Tesla announced in July 2016 that it was building a truck of its own. But Nikola didn’t receive the first of its patent approvals until this year – March 16. That’s nearly four months after Tesla publicly displayed its first trucks. Nikola has a different viewpoint. It filed the suit “simply to protect what we have,” said company founder and chief executive Trevor Milton. Trucks.com showed side-by-side photos of the two trucks to Geoff Wardle, head of the graduate school transportation systems design program at Art Center College of Design in Pasadena. “I’m pretty darn sure that I could find examples of those design elements elsewhere,” he said. 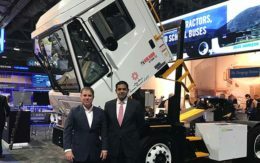 While Nikola’s cab design may have features that were unique in the trucking world at the time, courts often take into account the presence of those elements in other arenas when considering design infringement claims, Wardle said. He recounted a case in which he appeared as an expert witness for an auto parts company accused by a carmaker of copying its designs for fenders and other components used in the collision repair industry. “I was able to show that each part resembled the same part on another car that had existed before the design patents were filed. No one piece was original art even though it all made a unique model,” Wardle said. 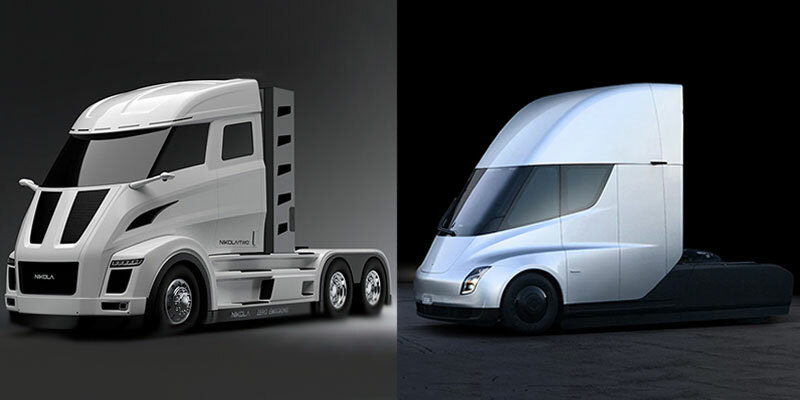 Nikola is alleging that Tesla’s cab design infringes on three of its patents – one covering the shape of the bullet-nosed fuselage, one for the wraparound windshield and one for the placement and design of the “mid entry door” that’s placed in the middle of the cab rather than at the rear as in most of today’ semis. “I might not find those on another truck, but look at motorcycle helmets and the bullet train,” Wardle said. Design has been treated a bit differently than other products in patent law since 1871 when the U.S. Supreme Court set up the “ordinary observer test,” Woller said. A lot hinges on who the ordinary observer might be. In the case of a cell phone design case, it could be any consumer because just about everyone uses and is familiar with cell phones. In its suit, Nikola maintains that Tesla’s stock market value soared by $2 billion in the weeks after it unveiled its electric truck on Nov. 16, 2017.